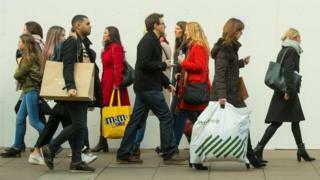 Strong consumer spending helped the UK's economy to grow faster than expected at the end of last year. The economy grew by 0.6% in the October-to-December period, the same rate as in the previous two quarters, according to an initial estimate from the Office for National Statistics. The figure indicates that the feared economic slowdown following the Brexit vote has not materialised. For 2016 as whole, the economy grew by 2%, down from 2.2% in 2015. "Strong consumer spending supported the expansion of the dominant services sector," said ONS statistician Darren Morgan. "Although manufacturing bounced back from a weaker third quarter - both it and construction remained broadly unchanged over the year as a whole." The quarterly growth figure was slightly better than the 0.5% rate most economists had expected. The dominant services sector - which accounts for about three-quarters of the UK economy - grew by by 0.8% in the quarter, helped by growth in the distribution, hotels and restaurant industry. Retail sales and travel agencies also supported growth in this sector, the ONS said. The figures also showed that the construction industry grew by 0.1% and agriculture by 0.4%, while industrial production was unchanged. After another set of economic figures stronger than expected, is this economic pain cancelled, or simply postponed? On that central issue rests the fate of the government's economic policy. If it is pain cancelled that means better real incomes for voters. It means higher tax receipts for the government, lower levels of borrowing and more leeway to spend money on public services. And, of course, confidence tends to beget confidence. This is the first estimate of the size of the economy in the fourth quarter of the year. At least two more will follow. The ONS points out that the data on which the first estimate is based is less than half the total amount it has access to by the time of the third estimate. Lee Hopley, chief economist of the manufacturers' lobby group, EEF, said: "While services continued to drive the economy forward at the end of last year, manufacturing output also made a small positive contribution, as growth ended the year on a solid note." However, she added that "challenges abound for forecasters in 2017". "Consumers won't be ramping up spending thanks to rising inflation and sluggish wage growth, and businesses' appetite to sign off big investments will depend on how they view the progress of Brexit negotiations. "There's every chance that this rate of expansion is the high point for the next couple of years." That view was echoed by Rain Newton-Smith, chief economist at the CBI business lobby group. "2017 will see headwinds to growth building, as higher inflation eats into households' buying power and investment wanes," he said. The economy: Pain cancelled or delayed?